MARGAO: India came back twice from the back to share the spoils with Myanmar in the final home fixture of the AFC Asian Cup UAE 2019 qualifiers at the Pandit JLN Stadium in Goa. Sunil Chhetri (13') and Jeje Lalpekhlua (69') found the back of the net in either half to register a 2-2 draw eventually. Thanks to the 2-2 draw, India are now firmly cushioned at the top of the group A of the AFC Asian Cup UAE 2019 qualifier with 13 points from 5 matches. Having conceded in the 19th second of the match, India regrouped fast. 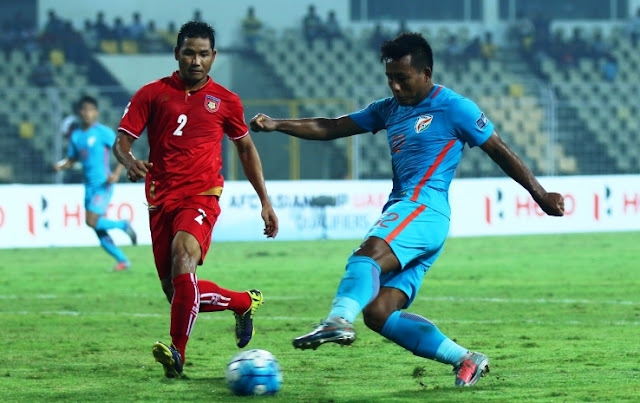 A build-up down the left enabled India to restore parity when Hlaing Bo Bo brought down Captain Sunil Chhetri down inside the box in the 13th minute. The latter gleefully converted from the spot digging it to the left of the rival Goalkeeper Kyaw Zin to score his 56th International goal for India. Six minutes later, Myanmar surged into the lead again as Kyaw Ko Ko rattled the back of the net from around 20 yards. But that didn’t demoralise India. Udanta Singh and Halicharan Narzary switched flanks and Udanta, in particular, did manage to sneak in past his marker on a couple of occasions but the rival defence managed to recover in time. 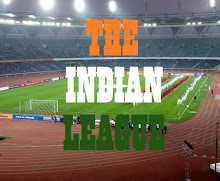 India came close in the 30th minute when Sandesh Jhingan leapt higher than all to connect Eugeneson Lyngdoh’s corner but an acrobatic Zin managed to keep it at bay. That apart, Chhetri ran past all in the 41st but his placement missed by a whisker. After the changeover, Halicharan tried a couple of long-ranger to beat the Myanmar goalie but his efforts went abegging. At the stroke of the hour-mark, Pritam Kotal swivelled a scintillating cross from the right wing directed to Chhetri but his steering header missed the target narrowly. The reigning 'AIFF Player of the Year' Jeje Lalpekhlua finally, hit the target in the 69th minute to cancel Myanmar's lead once again. Eugeneson Lyngdoh puts in a long ball from the middle of the pitch which was calmly converted by the sturdy striker. Stephen Constantine introduced the fresh pairs of legs of Bikash Jairu and Anirudh Thapa withdrawing Halicharan Narzary and Eugeneson Lyngdoh in the 76th and 82nd minute respectively. In the 84th minute, Chhetri took a calculated free-kick which could have been converted by Jhingan but finally, the defender's effort got jammed into the goalkeeper's gloves. India were awarded an indirect free-kick in the 86th minute and skipper Sunil Chhetri was spot on to hit the target once again, but his goal got cancelled as it went into the goal directly. In the added time, Jeje and Thapa combined well to pass it to Chhetri but the skipper's effort went just over the crossbar. There were some nervy moments towards the end but the scoreline remained same until the final whistle. India will play their last match of the AFC Asian Cup UAE 2019 qualifiers against the Kyrgyz Republic on March 27, 2018.